OK, now what’s Groove Sale? In my tiny but growing revenue stream, the two groups treating me best these days are Tidal and Groove. Thank you, thank you thank you! 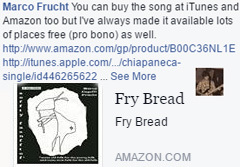 Looks like my most popular song in the U.S. is still Frybread but the biggest interest all over the world is for my “Swedish Folk Song.” Neat! And the second hottest song elsewhere around middle Earth kind of amuses and fascinates me. My “Redundant Song” isn’t even released as a single, just an mp3 and youtube that I put online when I had done a mini-midwest tour supporting GarageBand’s Choozapalooza thingie a couple Presidential elections ago. You can buy the song at iTunes and Amazon too but I’ve always made it available lots of places free (pro bono) as well. Here’s a snippet from my Thesis where I mention Mary Amato’s book “Guitar Notes.” Good stuff! Maybe with Mary Amato’s permission, excerpts from her Young Adult book Guitar Notes could weave through chapters five through 10 or so giving students a flavor of the very lore of musicianship and musicality from perspectives of a young dreamer or two. She even portrays young adults writing songs throughout the story and occasionally includes verses notated so someone could easily sing and play the melody on a guitar or piano. Once in a while she also includes a guitar chord diagram along with a suggestion such as, “try a Hendrix chord in place of the E7 when you get to the beating part. I think it would sound cool. Here’s the diagram for the chord, which is named after Jimi Hendrix, of course. God of guitar. I’m going to make you some guitar-playing videos and send you the links” (Amato, 2012, p. 139). With all that in mind, doesn’t this book take on a somewhat mixed-media or multimedia art form? Or perhaps a found art of sorts. Amato, M. (2012). Guitar notes. New York: Egmont USA. Holy wah. 6 years ago I forgot to include the actual link to the music video of a song so people had to find it on their own. The story behind “Chiapaneca,” a song. (Girl From Chiapas) – a Flamenco/Huapango mix. It is December 22, 1997. A paramilitary group called “Paz y Justicia” rapes and murders dozens of women and children at a prayer meeting in Acteal, Chenalho, Chiapas. One paramilitary chooses to leave. He picks up a little girl, Marcela saving her from harm. But later he is found out in the act of helping her escape to the neighboring village and they hang him after much torture. Aggressively they search for little Marcela but give up after a time. There are other witnesses they weren’t able to kill. Undetected, a young guitarist sits in the bushes; waiting for them to leave. He remembers everything he has seen. Make an ocarina out of clay. Several webpages and youtubes give instructions how. You’ll just need non-toxic clay, paper to put down for neatness and something pointy to make holes with. As you’re embellishing it you could refer to the book, “Music Before Columbus” to see many instruments that seemed to resemble pan flutes, ocarinas and rattles. Some of these technologies will not have changed much in 40,000 years so you won’t be just imagining it as you complete this that you’re in touch with a process that is quite ancient. Find evidence of musical styles and inspirations that existed in North America prior to the famous Christopher Columbus voyages. Use primary and secondary sources while attempting to discover what instruments will have been constructed from the resources available in the Americas. Many of your other primary and secondary sources will have to be found online. This museum has some other books that might be worth exploring too. Conduct research for the same evidence of musical instruments and styles in Italy and Spain. Craft a persuasive essay claiming Italy or Spain influenced America’s music. Craft another one saying the exact opposite that the Americas influenced Europe. Support this with deeper evidence than what you’ll find at Wikipedia. For example you will find ancient ocarinas mentioned all over Europe and Asia. Did China get this from the Americas so very long ago? Or was it the other way around? Perhaps they each came up with this without knowing each other at all. Explore the same possibilities for Spain and the Americas. What do you already know about the Underground Railroad? Watch a snippet of Reading Rainbow’s 11th season episode six about slavery in America. On one sheet of paper write down any new facts that you learned from this video that you did not already know. Next, include some of the things you already knew afterwards. Lastly, brainstorm a few things you would like to know more about this topic. Search for evidence of the historical Peg Leg Joe in addition to claims that he never existed in real life, but was just a legend. Make your own graphic organizer by drawing a T-Bar down a single sheet of paper. You can label one side Real but the other side Legend, and organize all your evidence to one side or the other. Are you ready for one of the most unusual but enjoyable short research projects you’ve ever done in your life? Using the melody from the old folksong “Follow The Drinking Gourd,” write some new lyrics based on this evidence of Peg Leg Joe. He is only featured in the original song as “The Old Man,” so you can keep calling him that, or call him Peg Leg, Mr. Peg Leg, Mr. Joe, or whatever fits to the beat of the song. It is totally up to you. There are many versions of this song you can find. You’re welcome to use mine free of charge. The new lyrics you make will basically become a brand new song. Your exit ticket is to sing the new lyrics or say them somewhat poetically. Make a short biographical paragraph about your favorite contemporary musical artist. Find out about an old, dead and nearly forgotten musician and do the same. Now compare and contrast the two. This will hit the added “synthesizing” from Bloom’s Taxonomy but it will also have you appreciating where music comes from and where it might go. Creativity is the limit if you hold strictly to the theories, but it’s the sky when you think about it, and music stretches across all of them and everywhere else. Gather information about what he’s been studying, and what school gave him a PHD in Astrophysics. Compose a small moment story about the astrophysicist who became a rock star. But replace yourself in as the main character as if you were Brian May. Essentially you will drop out of college in the middle of your thesis to become a rock star and tour the world and then go back to complete it after your band has already made it. List one specific thing you want to be when you grow up. Try to remember some other things you always wanted to be. There were probably many. Using just internet searching try to find some ways that you can be at least two more things besides your main choice at the same time. Create a simple text file listing the 3+ things you want to be when you grow up. Next to each one list at least two ways it’s possible. Now in one paragraph or less at the bottom of the same text file, title it “Action Plan,” and simply state how you’re going to become at least three different things when you grow up. How many musical instruments can you identify. What musical styles do you think you hear Rhiannon’s band interpreting? Do you consider this an old song or a new one? If you’ve ever heard this song before, how is Rhiannon Giddens’ version different and how is it the same? Write a small moment from your life into an essay that might be worth “voicing over” a StoryCorps podcast someday. Perhaps write about how your own family keep some of your traditions alive. The story can be as complicated or easy as you wish it to be. Yes, it can be about a turtle you saved from getting squashed by a car once, or it could be about a dad attending his daughter’s kindergarten class as a surprise because he’s home from the war. Surely something that’s happened in your life so far can be something you might want to “tell the whole world” with the help of the StoryCorps van. Start from the same Storycorps’ “Keeping Family Traditions Alive,” from the Skill Activity. Now using an iPad, record and edit a StoryCorp-styled podcast of a small moment from your life. Interview yourself, or a friend, or have a friend interview you. You might want to script it yourself, or at least start from a one-page organizer. For instance, I’ve been trying to talk my mom into letting me record her telling about the time when she was in her Junior year of High School and her date to the prom was Billy Martin from the New York Yankees. Build a paper plate or papier Mache mask and teach yourself a circle dance similar to one that False Face Societies have done for thousands of years. There are plenty of tutorials on how to make a mask online. Sample a few and find one you can make most easily. One challenge you will face is that you will find many more images of these than videos. The more traditional dances tend to forbid filming. Yes, you may blend stomp dances and smoke dances to get an idea of what the same groups do. And then totally use your imagination how your mask will dance based on how you created it. Your role is to be the arms and legs of this mask as it travels time and space. Get it? Watch 29Oct15 Time For Kids video about Niizhoo (nee-shoo) Sullivan, 11, who loves to sing. Niizhoo (nee-shoo) Sullivan, 11, loves to sing. He’s the lead singer of the drum group Hay Creek. He has won several singing competitions. Niizhoo’s family lives in northern Wisconsin on an Ojibwe reservation. Read the full article about Native singers and dancers if your school provides it. On a piece of writing paper generate five fast facts from the video. (For example, I noticed an ancient stick being used as a boom stand for a microphone by probably a proud dad or uncle. My first thought was “that’s so ghetto,” but then I realized with the microphone it is a perfect blend of the modern and the ancient all together in one place and time. Take a Google Maps journey to Wisconsin where Niizhoo lives. Learn some fast facts about his tribe but also some of the other tribes in his state. You can start with Oneida, Menominee and Potawatomi to be sure. There are many tribes represented around Wisconsin. Build a graph showing Tribal names and the differences and similarities represented. Watch a short video of someone playing a wineglass harp. Because rubbing the glass takes so much practice you will be making a simpler version of this harp where you’ll tap lightly with a pencil. Write some notes from remembering or replaying the video. Did the different amounts of water seem to make sounds higher or lower? Did you have to hit hard to make a sound? Materials: 8 Beakers, test tubes or glass bottles. Water. Unsharpened pencils. Fill each of the eight beakers or glasses with different amounts of water. Experiment by tapping lightly on several glasses, getting familiar with whether larger or smaller amounts give a higher or lower note. That is as far as this activity will go. Give yourself a mini-lesson online looking up pitch’s relationship to size in all musical instruments. You’ll see that this applies to everything from church pipe organs to drums and everything in between. Predict whether to line up the eight “notes” from full to empty, organizing it in a sensible way. Make any necessary adjustments after tapping several glasses. One more adjustment: if you sense that one or more notes were much too high or low, try adding and subtracting water until it’s close. Voila! You’ve constructed another musical instrument. This hundred year old song began in Virginia and spread all over the nation memorized as a skipping song for a long time before it was ever written down. Playground rhymes like this are some of the earliest inspirations for Hip Hop music. List as many other Skipping songs, playground rhymes and jump rope tunes as you can from memory. The song “Mary Mack” is all about movement and beat; and this is why it made a great jump rope song. It was also perfect for Rap and Hip-hop as the video’s elephant character Lil’ P-Nutt explained. Make your own personal chalk-talk on a portable whiteboard by listing any other jump rope or skipping songs you remember from when you were young. If you don’t remember titles you can try to search for them on the web. Organize half a dozen or so by how much rhyme you see and how much rhythm you can feel. Next you can pick one or two to make into a freeform rap. Either write them the same way and experiment out loud how you would sing them, or change the words around to suit the newer form. Record your rap from the previous skill activity to iPad. You will need to be good at Garage Band or iMovie. There are tutorials galore online. but if you already know iPad, go for it. Measure all the strings of a guitar. Length and width count. Listen and compare to see if both length and width correspond to pitch and tone. In other words, does each string have a lower or higher sound? Does it sound fatter or thinner? Is there any difference in volume or how long the string sustains after you pluck it once? How are guitars and pianos similar and different. Search internet to find the following items and label them nearest to where they should be on a common guitar. Anything else you can fit on the diagram. Now research online to find five basic parts of a Piano. Compose a short paragraph describing as many similarities and differences as you can find. Design just the hit points and lives for a video game where the following two characters go to war against each other. One character is a guitar. Give him/her a name and use the Skill Activity from this card to come up with some criteria for points. Do the same for a piano. What is his or her name? Does s/he have some of the same hit points? Are some higher/lower? Using the Online CIA Fact book learn some fast facts about Brazil’s people and culture. Now give yourself a mini lesson on Carnival elsewhere on the Internet. Find footage of the Sesame Street float in the Macy’s parade. Do you think Big Bird’s costume is inspired by Brazilian costumes? Yes or no, and why? Do you think there was more preparation for the Macy’s parade each year or Carnival? Which do you like better, and why? Traditional essay. This is a good one to use lots of sound and color words. Also, be on the lookout for metaphors. Project/Product: Compare and contrast Carnival and the Macy’s Day annual. Find a pen pal in the Dominican Republic, Kurdistan or a faraway place of your choosing. Learn everything you can about his/her culture and discuss. Tell them your favorite singer and ask if they have favorites. Ask about music but also festivals and dances, foods, clothing, everything. Search for as many similarities as possible. Thanks to the Internet our two cultures have influenced each other in so many ways over the years. 2) Virtual field trip. Find reservations and Indigenous tribes nearest to your school. Next watch snippets of a Gabra shepherd boy from David Mayberry Lewis’ Poor Man Shames Us All. 49:13-50:00 do you like my song? Lastly, just ponder the concept of giving a song away to someone for free. Goal: try for 3 levels of compare/contrast: Gabra versus. NYC., African music vs. American music and more specifically traditional music vs. popular music. Just make notes of these “C&C’s.” It doesn’t have to be a formal essay. Watch an advertising agency spending millions of dollars creating a jingle that was co-written by Ray Charles. 50:04 In NY songs are not for giving they are for selling. Hundreds of singers and bands were invited to make music to those words. They were paid well even if their music wasn’t used in the ad. The first of many ads premiered during the commercial break of the Super Bowl XXV. Action: Write a few words requesting people purchase camel milk from a family in Gabra because they’re very nice. Now see if they can fit right onto one of the many ads already made. Teach yourself how to remove vocals from a song using the recording tools app Audacity. Quickly jot down some lyrics that could seem like an ad for camel milk. Either sing or speak a track over the music persuading people to buy camel milk from the Gabra family you previously studied because they’re so nice. Here’s another musical memory to share. It was the weekend before Thanksgiving I remember that. 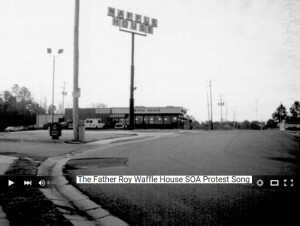 I was on a bus returning from Phenix City Alabama to Green Bay Wisconsin and a friend of mine, John Heckenlively counted 22 Wafflehouses that we drove by. That was only the ones where you can see their signs from the road or they have a listing in one of the roadsigns along the highway! I’m sure there were many more. So in between counting we crafted this parody of Arlo Guthrie’s classic hit, “Alice’s Restaurant.” John also called a friend of his at Z Studios in Milwaukee and purchased studio time on a 2 inch master. We did this on almost no sleep the minute we got there. I already had a guitar along for the trip so we walked right in there and recorded it. I’d say unrehearsed but we probably went over this song several dozen times on the bus instead of trying to sleep! The last big memory I have of that session was that the song was almost exactly the time length of a 2 inch master tape. The engineer said afterwards he was stressed out at the very end because he was thinking any second now he would have to stop us and back up a tiny bit, then continue on trying to punch that in without too many noises between takes. He figured he’d just let us finish to not ruin our momentum and then just ask us to do the last part one more time. You see a traditional reel or spool is set for just a little bit more than 16 minutes. And this song came in at 16 mins and 40 some odd seconds. Back in the analog days they gave you 30 seconds or so of extra tape just to be safe but you shouldn’t count on it. I held the last G chord out for a sustain and natural fade, and just then tape machine started slapping that last piece of leader tape around and around at the first part of complete silence. pps: John sent it to Arlo Guthrie and he liked it! Music Hits All 9 of Howard Gardner’s Intelligences? Just How Does Music Hit All 8 of the Other Gardner Intelligences? 1. Naturalist: sensitivity to natural world features. 3. Logical-Mathematical: 32nd? 64th? 128th note. Think about the 8-bit computer chip! 4. Existential: Why are we… how’d we get here? Synthesizing idioms, metaphor, myth. 5. Interpersonal: Plays well with others. We be jammin! 6. Bodily-Kinesthetic: Fretboard logic, sound holes, air, pitch, breath. 7. Linguistic: Applying complex nuance, entendre, evaluating the inferred. 8. Intra-personal: Compare/Contrast self to others, community actualized. 9. Spatial: Analyzing time/space, abstract and concrete. Reasoning on the fly. Filed in Academic, Mundane Or Sublime, Music and Stuff, Poetics, Tech | Comments Off on Music Hits All 9 of Howard Gardner’s Intelligences? INQ 3–5.4 Determine the kinds of sources that will be helpful in answering compelling and supporting questions, taking into consideration the different opinions people have about how to answer the questions. INQ 3–5.5 Gather relevant information from multiple sources while using the origin, structure, and context to guide the selection. INQ 3–5.7 Identify evidence that draws information from multiple sources in response to compelling questions. Also covers the concept of Place-Based Media Arts as developed by Rachel Tso at STAR school, Flagstaff, AZ. Students have been comparing and contrasting primary and secondary sources. Earlier this year they went on a field trip to a museum where the director taught them a bit about Oral Tradition’s role in Colonial America. Next week they will visit New London, CT’s Joshua Hempstead House where some slaves rested a while along their way toward Niagara where many found freedom. 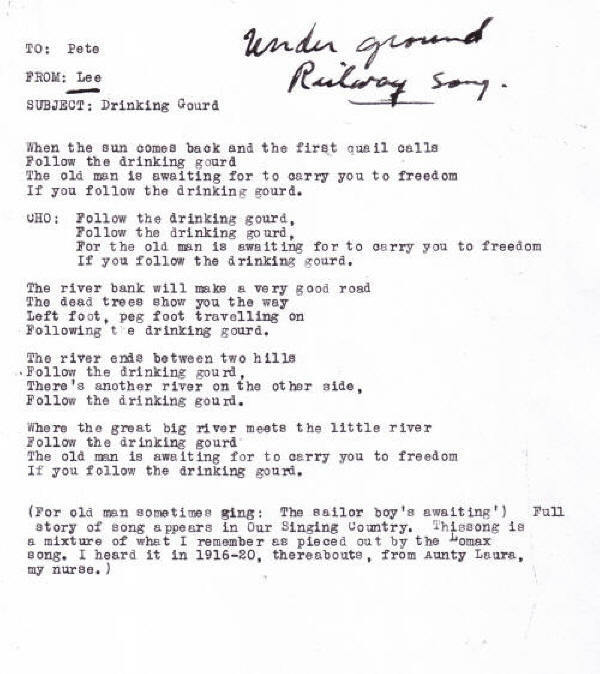 Students will show understanding of the Underground Railroad through the secondary source of Folk Hero Peg Leg Joe’s song, “Follow the Drinking Gourd,” and a primary source such as Lee Hays’ letter to Pete Seeger with the lyrics to the song. Students will evaluate the folksong to determine whether it is a primary or secondary source; additionally whether it is history or oral tradition. Each student will show proficiency and participation in a team completed research paper to better than 85% achievement. Students will use the “chalktalk” method to brainstorm and create their own writing prompt. Some will do alternative related research and present a short TEDx styled talk to the class which can be used by each small group as an additional source for their one-page paper they will complete and sign off on. 2. “Follow The Drinking Gourd” song. 3. Facsimile of original document, Letter from Lee Hays to Pete Seeger with song lyrics. Standard classroom for most of the lesson, differentiating for one student who is twice exceptional and two slower learners then we will move to small groups and presentations. Paper and pencils will be set out before students arrive They know they’ll have a writing prompt of some kind whenever they see that. They always set it to the side and keep it there knowing they’ll be told when to write. Students and teacher will share many methods to find North such as looking at the Sun, observing moss on trees and rocks, seeing shadows on the ground, as well as using compasses and modern day GPS. Students will compare a birdhouse gourd to a picture of the Big Dipper and discuss how the Big Dipper and Little Dipper got their nicknames. Discussion: Finding Your Way Out If You’re Lost in the Woods. Snippets of LeVar Burton’s “Reading Rainbow.” Pass around a dipper gourd while they watch. Based on the song “Follow the Drinking Gourd”, this show explores an infamous chapter in America’s history centered around the song “Follow The Drinking Gourd.” Burton introduces the heroes, stories and music of the African-American culture which emerged from slavery. I will sing verse and two choruses of a parody of Tom Paxton’s “What Did You Learn in School Today,” with some takeaways from the day’s lessons; then before they’re even fully engaged I’ll put the guitar down and ask them to help me dream up an additional verse while I’m note-taker at the whiteboard. Which students do you anticipate may struggle with the content/learning objectives of this lesson? Student name Evidence that the student needs differentiated instruction How will you differentiate instruction in this lesson to support student learning? (Names Fictitious) He does great work when not stressed out. Shuts down quickly with most written assignments. Brendan, Tyla and Dylan will form a cohort researching oral history, so will not be pressured to write any “finished copy” today. Small group will search online for rumors and legends of Harriet Tubman having stopped in New London, CT staying with escaped slaves at the Joshua Hempstead house on their way to Niagara Falls while others are finishing writing prompt. They’ll relate their work orally to teacher having taken turns as a group. After research is cleared, these students may either present to the whole class or join other small groups and share what they’ve learned from memory in case others want to use some of “their oral tradition” in their written work. They may add their name to the other groups’ work. Tyla She loses focus often. I believe her biggest difficulties come when she finds a lesson boring. Same. Which students will need opportunities for enrichment/higher level of challenge? Often refuses to write. Same. My students met 100% proficiency if I assess the three differentiated students’ work the same as those who did actual writing. If I’m not allowed to do that they still met the 85% mark because 24 of the 27 were able to show an ability to complete this as the primary composers of the written work. I will attempt to make a strong case for the helpful research shared orally being just as important as the written work, as per the prior field trip where the museum’s director showed how important Oral History was to Colonial America’s history, especially regarding longstanding Native American traditions. All students met the spirit and letter of Inquiries 4, 5 and 7 from the 3-5 content standards as stated in today’s Lesson Plan. Additionally each of these students can now share many different methods to finding their way out of the woods both day and night without modern technology such as a compass or GPS on their phones. So some life skills as well cross disciplinary skills have been acquired, gaining much self-efficacy. For example learning about moss on rocks can be everything from Geology to Health, not just Social Studies or American History. The work with primary and secondary sources will help them their whole lives whether they’re writing a scientific research paper or a memo to a coworker. Getting Kids to Love Love Love Reading! How Do We Go Beyond Instilling a Love of Reading toward Sustaining It as a Habit for the Lifelong Learner? Just how can we keep young people so excited about reading that they never want to stop? When I grew up reading was such a central part of my family’s culture that my sister and I were asking to read right from the beginning; but it’s been my observation that many kids feel like reading is such a chore that they come to dislike it from an early age. In fact, I guest teach in many different schools and students everywhere are quite outspoken saying they “dread” and “hate” moments they are told to read something for content. I never felt that way but some of my own friends have. My parents subscribed to both the Hartford Courant and New London Day newspapers as well as half a dozen magazines. It was commonplace to see any of these in their hands around the house; but summers always saw my mom and dad sitting right next to each other in beach chairs reading sections of the papers or People magazine and conversing about it! At five or six years old, I wished to emulate them. As I look back on those times, I recognize that not only did my parents love to read, they had developed their own habits for reading during just about every spare moment they had. They went beyond that too in modeling the same thing for my sister and me. Let’s explore some “tricks of the trade” for distilling a love of reading into a completely sustainable habit. She suggests encouraging students to keep a book with them at all times, essentially having it handy everywhere they go, creating customized “preview stacks” of books for each student in the classroom, and also promoting that the children read a book series now and then which establishes its own “schedule” since students will look forward to each next book. Having words surrounding a young person’s environment can be helpful in sustaining the desire to read no matter what age the reader is. You might discuss everything from street signs to promotional signage for a store. This is a compelling way to keep young people curious. “A child cares a lot more about seeing the word ‘open’ when she knows she can play in the park,” says Sally Moomaw in her book “Get Ready To Read!” [Moomaw,132] With a baby or toddler, you can point to signs such as that park’s ‘Open’ sign, and just tell them what it says. Perhaps ask them what it says the next time he or she sees it. Then as they get older, you could ask some rather engaging questions about signage around them. Maybe ask them why the sign says ‘Open’ rather than ‘welcome’ or ‘come on in.’ While pumping gas, ask questions about the percentage of ethanol mixed with unleaded gasoline. This leads quickly to an inquiry as to just what ethanol is, and why a car needs both ethanol and gasoline instead of 100% ethanol. Let the child guess on their own that maybe 10% is the most flammability that will still work with today’s engines. As soon as you are near the Internet, you could ask him or her to look it up and make even more educated guesses. Without sounding too preachy, try to remind them that they are discovering all these things by reading. They love to read, right? One would hope so. Dan Rearick at Preston Veterans elementary school utilizes word walls and book nooks and the other usual fare to keep his 4th graders engaged; but he also does something I haven’t seen in any other schools yet. Years ago, he brought three large trophies in from home that he keeps on a mantle throughout the year. They are three different sizes for 1st, 2nd and 3rd place. His students compete on how many books they have devoured but also on how compelling their short essays are as they review each book. He judges all of that periodically and once a month places three new names on the trophies. When I have subbed in his classes, the kids always ask to read when they completed each task while waiting for their classmates to catch up. None of them need to be assigned SSR (sustained silent reading) time and they need no reminders to look for new books. Their desks are busy with everything from “Captain Underpants” to “Harry Potter” and books of all page counts in between. On a website called MinimalStudent.com a writer named Jessica Dang published a tip that I simply must include from this paper even though the current wisdom says never cite someone from his or her own personal web page. Feeding an obsession over a topic or genre sounds like a wonderful way to keep a student reading more and more books. I recall fondly when I was in elementary school that no one ever needed to talk me into reading about soccer, baseball or guitar. These were my personal enthusiastic fascinations and I can tell you the Biography section of every library was my home away from home. I wanted to know so much more about Pele, Carlton Fisk and Jimi Hendrix than any one library or bookstore could tell me, that’s for sure. Occasionally, my mom would have make suggestions such as reading about Arthur Ashe’s tennis career or Albert Schweitzer’s piano playing in an attempt to nudge me just a little bit wider from my obsessions. In addition, my dad was always surprising us by insisting I read “Little Women,” or that my sister had to leave the “Nancy Drew” books for a little while to try just one from my “Hardy Boys” collection no matter how “icky” she assumed they were going to be. I might digress a tiny bit to mention anecdotally that my parents were among the last generation of American homeowners to answer their door for an Encyclopedia salesman and actually follow through by purchasing one alphabet letter each month. On rainy weekends if I told my dad I was bored with all the other possibilities around the house he often picked a random page number and letter name and told me to read a full page and get ready for an informal quiz. I’ll never know how he got me to believe that would be fun. I think I just looked forward to him showing me where I was right and wrong. Now, a song lyric caught my eye at SongsForTeaching.com while I was researching this paper. The lyrics feel similar to “You’ve Got To Be Carefully Taught” from “South Pacific,” even before you listen the song’s audio track which they provide right there on their webpage in an embedded music player. An MP3 of the song itself might even serve as a tool teachers could use by playing a snippet before a “book talk” or a read aloud. I might even consider it for the beginning of a daily SSR timeslot since it would serve as its own mini pep-rally of sorts. When discussing a long-sustained love of reading who can leave out LeVar Burton? Public Television’s “Reading Rainbow” series kept me engaged throughout my entire youth. Burton begins each show with inquiry questions about topics such as the Underground Railroad, or “How to Make an Apple Pie and See the World.” Then he pairs it with an entire book reads to the television audience. It had a 20 year run and trailed off a bit but now there’s a brand new revived series with a modern digital-age app that began less than a year ago. His group is currently working on moving all of the archives from PBS over to their very own webpage at http://www.readingrainbow.com. Reading Rainbow’s success shows that children who dislike reading still love when someone reads to them. Burton’s slogan “you don’t have to take *my* word for it,” will always gently nudge them toward reading things in a book for themselves. Often times the show ends with three or four similar books, the viewer can ask about if they want to teach themselves even more. With these in mind, I would say it is plausible that reading obsessively boosts cognitive abilities and increases self-efficacy. The cliché “…more you know, the more you want to know,” seems apt here. None of these tips alone will have someone identify as a habitual reader. Nevertheless, with many of these factors in play early in a young person’s life there is a greater chance they too will keep the reading habit forever. Anderson, N. (2009). Elementary Children’s Literature: Infancy through Age 13 (Third ed.). Boston, MA: Pearson. Moomaw, S., & Hieronymus, B. (2006). Get ready to read! : Making child care work for you. St. Paul, MN: Redleaf Press. Filed in Academic, Music and Stuff, Tech | Comments Off on Getting Kids to Love Love Love Reading!